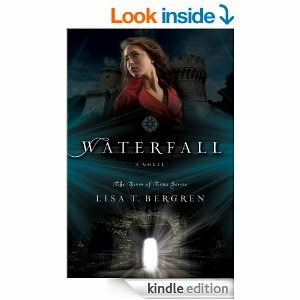 But being the sucker that I am, I automatically gravitate to any time travel story, and that’s how I came across Lisa T. Bergren’s, Waterfall, (River of Time Series). This story is about two sisters, Gabi and Lia, who travel back to 13th century Italy and find themselves in the middle of a battle between two political factions. Upon arrival, the sisters are separated, one taken in by each side, so you can only imagine what a problem that would make, especially when Gabi (who is the older of the two) is so intent on reuniting with her sister. The way Ms. Bergren plays out the story is entertaining and intriguing, and, of course, there’s a love story woven into the story as well. I actually think that might be a law—all time travels have to include a love story—but at least Ms. Bergren didn’t make it the main focus of the story, which I appreciated. She included just enough history to make the story interesting, but not boring, lots of action to keep it moving along, and the sisters made the right amount of blunders that you would expect a modern teenage traveling back in time to make. I personally would have like to have seen a little more of a language barrier than what was shown, but the story itself drew me in so that I didn’t stop and go, “oh, come one!” a single time, so I guess it didn’t bother me too much. All in all, I thoroughly enjoyed this book and recommend it to any and all who enjoy a little history and a little time travel. I do think the next books in the series are priced a little high – $7.49 for the Kindle edition- but I can always pick it up at my local library, so not to worry. If you’d like to check out Waterfall, click here and happy reading!